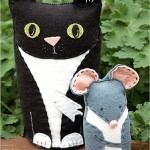 Some of our excellent range of soft toy patterns plus amazing fabrics and stuffing equals easy to make kits. Get them soon as there are only a limited number of each kit. Please see individual product descriptions for exact contents of each kit. If there is a pattern you would like to see made into a kit, please let us know!